As you travel around Barbados, you're sure to notice the many beautiful, colourful and inspiring murals that line buildings and boardwalks. These public displays of art depict the history, culture, traditions and natural beauty of our island. While most are painted, some like the mural along the south coast boardwalk, are created from colourful pieces of broken local pottery. Other murals are in the form of advertising, on the side of rum shops and on vendors' carts. At a beachfront location in the northern town of Speightstown is this incredible 80ft long and 20ft tall creation. 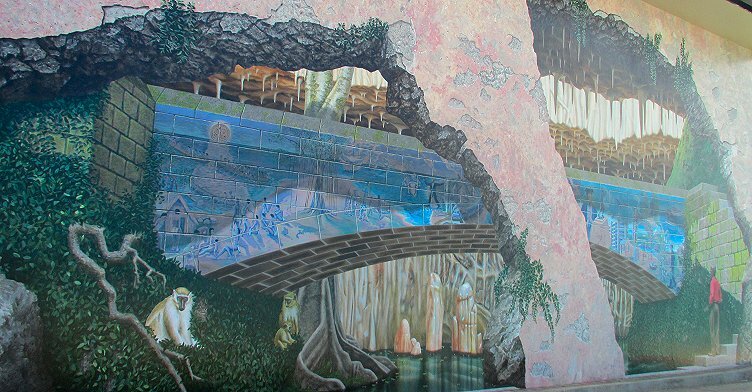 The mural uses realistic imagery to paint a picture of the history and natural beauty of Barbados. Scenes of Harrison's Cave blend seamlessly into historical scenes of the raising on Barbados' flag at Independence. Green monkeys overlook chattel houses and the original Amerindian inhabitants of the island. It seems that each time you look at the mural, you see something new that your eyes missed before! As you stroll along the south coast boardwalk, in the vicinity of Hastings Rocks, look out for this colourful mosaic mural made from broken pottery. In addition to beautifying the area, the mural raises awareness of the importance of sea turtles, many of which lay eggs on the beaches along the boardwalk. 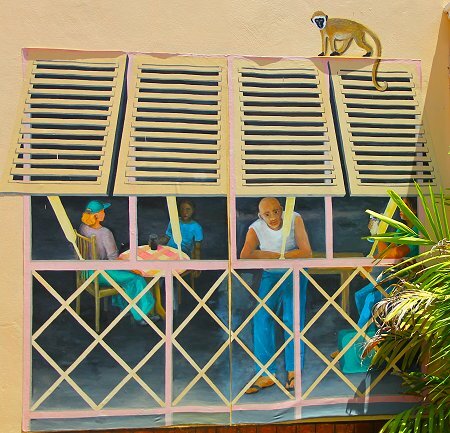 Perhaps one of the most famous murals in Barbados is this unique and colourful one in the rural parish of St.Joseph. The work blends with the natural limestone formations to create vibrant scenes. Tour guides often pass or stop here as part of their island tours. This beautiful mural is located at the Pelican Village Craft Centre on the outskirts of the capital city Bridgetown. It is painted on the wall of the restaurant and invites you in for a refreshing drink or delicious lunch. When the day is done... head to the rum shop! Many local rum shops boast colourful murals expressing sentiments of relaxation and encouraging passersby to stop in and fire a rum!